When and if the Nankai Trough Earthquake occurs, it is forecast that the coastline in Kochi Prefecture will be hit by a tsunami as high as 34.4 meters. Therefore, local governments as well as companies and citizens in Kochi must join together to come up with methods for disaster prevention and damage reduction. Since ancient times people in Kochi have suffered damage from natural disasters such as typhoons and torrential rains, in addition to earthquakes. We have a history of recovering from such disasters by learning from past experience and developing new technologies. Companies in Kochi Prefecture have a strong sense of mission to develop useful products and technologies for disaster prevention and damage reduction due to the impending danger from the predicted Nankai Trough Earthquake. This determination, combined with knowledge gained from past experience, has enabled them to become leaders in the field. Interest in disaster prevention among residents of Kochi Prefecture has increased, prompting companies to develop disaster prevention products in their respective specialties. We are mounting an effort to create a virtuous circle in which demand for disaster prevention products and technologies that are 'Made in Kochi' contributes to economic activities in the prefecture, leading to the further development of products to prepare for natural disasters. Local governments and private companies are working jointly to achieve that goal by promoting disaster prevention related businesses. The Kochi Prefecture Disaster Prevention Related Business Exchange began to host meetings between disaster prevention related businesses in 2012. The purpose of the meetings is to publicize disaster prevention products and create more practical products that meet the demands of actual disaster situations. They promote the exchange of information among local municipalities and introduce members to each other. 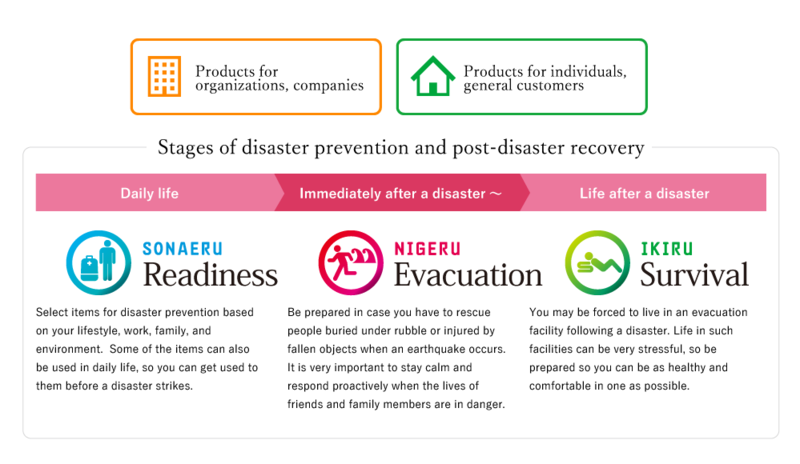 Products used at disaster prevention exercises held in Kochi Prefecture are highlighted and local companies are matched up with major buyers of disaster prevention goods. The Exchange further helps companies by certifying products to stimulate sales growth. In order to help solve various problems faced by companies in Kochi in relation to the development of disaster-related products and technologies, we dispatch specialists as advisors and provide technical assistance in cooperation with research institutes. In addition, we conduct market research and product development support using subsidies and place disaster-related product information on a special portal site. We also give assistance in making business strategies and plans (product plans) to develop market channels in cooperation with the ‘Product & Trade Development Center’ situated in Kochi Industrial Promotion Center. Operates a Kochi Prefecture booth at major exhibitions of disaster prevention goods all over Japan to promote such products from Kochi to officials in charge of disaster prevention at local municipalities as well as large trading companies. Develops overseas sales opportunities to further expand business opportunities for disaster prevention goods that are 'Made in Kochi'. Kochi Bosai is a portal site which promotes products and technologies certified as Kochi Prefecture Disaster Prevention Related Products. Certification screening is conducted by the Kochi Prefecture Disaster Prevention Related Business Exchange from the point of view of product quality and safety. 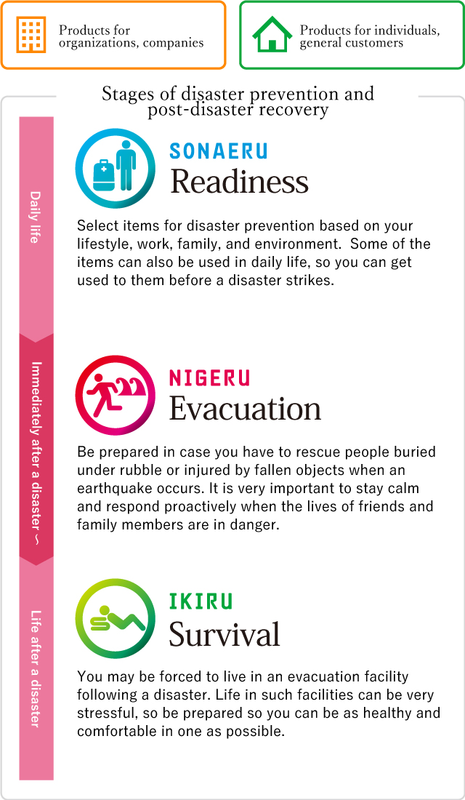 Products and technologies for organizations and businesses as well as products for private use by individuals and general consumers are divided into three groups according to the stage of a disaster - 'Readiness', 'Evacuation' and 'Survival' - they are most suitable for. We hope you utilize disaster prevention related products and technologies from Kochi for your disaster prevention and damage reduction planning. For inquiries, please contact each manufacturer directly. The Product & Trade Center disseminates information about products manufactured and technologies developed by companies located in Kochi, including disaster prevention related products, machinery and products derived from civil engineering. Our trade coordinators, located in Tokyo, Osaka and Nagoya, may meet with customers to show samples listed in product catalogues and make product presentations.